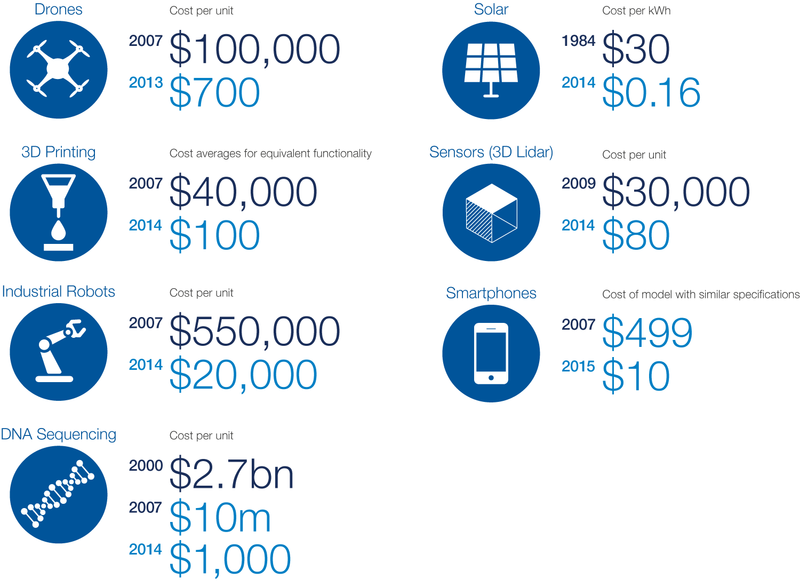 One of the defining characteristics of the digital revolution is the plummeting cost of advanced technologies. 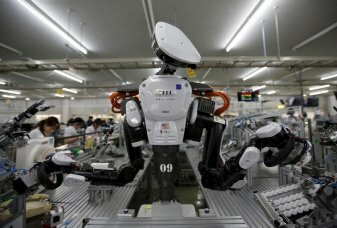 Cheaper and better technology is creating a more connected world: today, there are 8 billion devices connected to the internet; by 2030 it is forecast that there will be 1 trillion. And the ‘combinatorial’ effects of technologies, such as mobile, cloud, sensors, analytics and the Internet of Things, are accelerating progress exponentially. The astonishing pace of technological advances is making it difficult to clearly understand digitalization and fully grasp its implications. Consequently, a number of influential myths have sprung up. A common perception is that digital disruption is bankrupting incumbents and that there is no way back for them in the digital economy. Another myth we encountered is that digital is just a back-office issue focused on achieving operational efficiencies. A third misconception is the belief that companies can implement a successful digital transformation simply by launching a digital business unit and hiring a chief digital officer. These myths need to be debunked before an effective strategy for digitalization can be developed. Incumbents will need to transform themselves into digital enterprises to thrive, and this transformation will need to be far more profound than merely investing in the latest digital technologies. Companies will need to search for new business models, fundamentally rethink their operating models, revamp how they attract and foster digital talent, and consider afresh how they measure the success of their business. Companies need to fundamentally change the way they identify, develop and launch new business ventures. We have identified operating model archetypes for the digital era and outlined the steps needed to implement them. Digital leaders follow a lean approach to both core and support functions. We have looked at how enterprises can attract, retain and develop the right talent. Organizations must embrace the cultural transformation and encourage millennials to join their workforce. Finally, we have assessed how companies need to adapt to different ways of working, whether it’s integrating robots or on-demand workers. Many companies have discovered that traditional key performance indicators are no longer effective. We have outlined the digital traction metrics that matter and explain the importance of monitoring – and reacting to – them in real time. Incumbent businesses looking to become digital enterprises face two main challenges. First, the business model that served them well for decades has been disrupted by digital innovation and no longer works as desired. Second, attempts to create new, viable business models for the digital age will flounder unless a company is willing to disrupt itself. This bind has been termed ‘the innovator’s dilemma’ and was first outlined almost 20 years ago by Clayton Christensen. 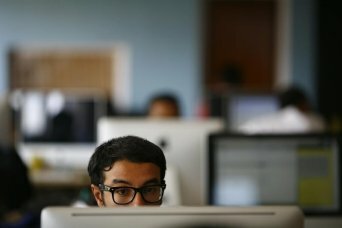 Besides the fear of cannibalizing profits, other obstacles standing in the way of incumbents looking to launch new business models are a risk-averse culture, a lack of creativity to identify radically different business models, and insufficient decisiveness to commit resources to experiment with new models. Despite these difficulties, some enterprises have managed to successfully innovate and change their business models. Michelin has leveraged the Internet of Things (IoT) to shift from the business of selling tyres to selling outcomes (performance promise supported by a money‐back guarantee). EFFIFUEL™ is a comprehensive ecosystem including sophisticated telematics, training in eco-driving techniques and the EFFITIRES™ optimized tyre management system. The service can lead to a reduction in fuel consumption of 2.5 litres for every 100 kilometres driven, equivalent to at least a 2.1% reduction in total cost of ownership for truck fleet operators. While the idea for the ‘as-a-service model’ was developed internally, Michelin realized the need for partnering, especially in the field of big data analytics. Factors behind its success have been an emphasis on cultural change, coupled with a focus on an iterative approach, built around pilots. 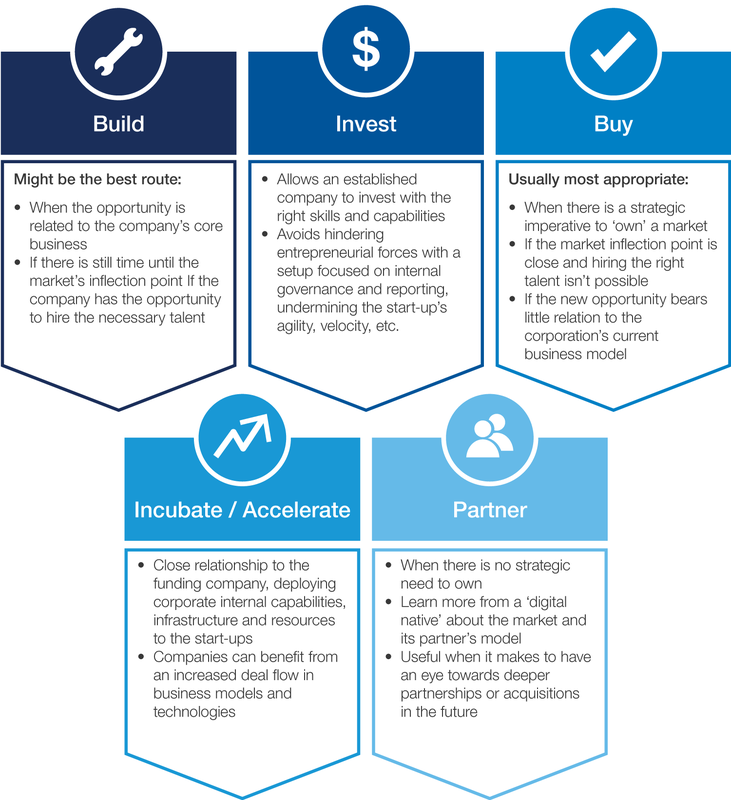 For incumbents looking to transform their business, there are several paths to choose: build, buy, partner, invest or incubate / accelerate. The path they choose is likely to be determined by the following factors. Digital transformation is not a superficial process designed to achieve some incremental efficiencies, but a profound change. Incumbents will need to reassess and remodel every aspect of their business if they are to successfully compete against digital natives. To what extent have you enhanced your strategic toolkit? Is your corporate development approval cycle sufficiently agile? Do you feel secure in sensing and anticipating digital disruption? For existing corporate venture capital arms, is it bringing scale and protection to the existing business? Is digital explicitly integrated into strategic plans in and across business functions? How are you empowering employees through digital channels to enable faster decision-making and encourage greater agility within your organization? To what extent have you adjusted your operating model towards a multi-speed operating model? Does your operating model flexibly support ecosystem partnerships, be it by creating your own platform versus ‘plugging in’ to others? How much of your revenue is coming from new sources of digital business? Is the growth rate at par with or higher than digital competitors? Does your company leverage analytics around customer data, operational data, fraud analytics and compliance? Do you benefit from data to launch new business and revenue models to mitigate erosion in the core business? Is investment in security an important board-level issue? What is the worst-case scenario for a security breach? Do you have a digitally literate leadership team? Have you established appropriate training schemes to overcome the digital skills gap and reskill your existing employees? Are your internal policies up-to-date to allow collaboration and knowledge sharing using social media tools? To what extent can your corporate culture cope with constant change and is it considered attractive for millennials? Is your existing workforce demonstrably improving productivity and quality? Have you identified areas in your business where automation is most relevant? Have you assessed the likely impact of robots and artificial intelligence on the traditional workforce? Have you developed strategies and frameworks that take into account all the functions and tasks in your enterprise where you can leverage and benefit from the on-demand workforce? Have you established the right behavioural KPIs to measure the traction of your digital business models (e.g., user engagement) or do you solely rely on financial metrics? To what extent are capabilities and mechanisms to track metrics in real-time in place and do you take the appropriate decisions and initiatives to benefit from the insights you gathered? What steps have been taken to convince your investors about your digital vision and the long-term value creation impact (top and bottom line) of your digital transformation journey? Leaders across all industries are writing the next chapter of the digital economy. It is time to either become part of the story or just another footnote in the history of disruption.